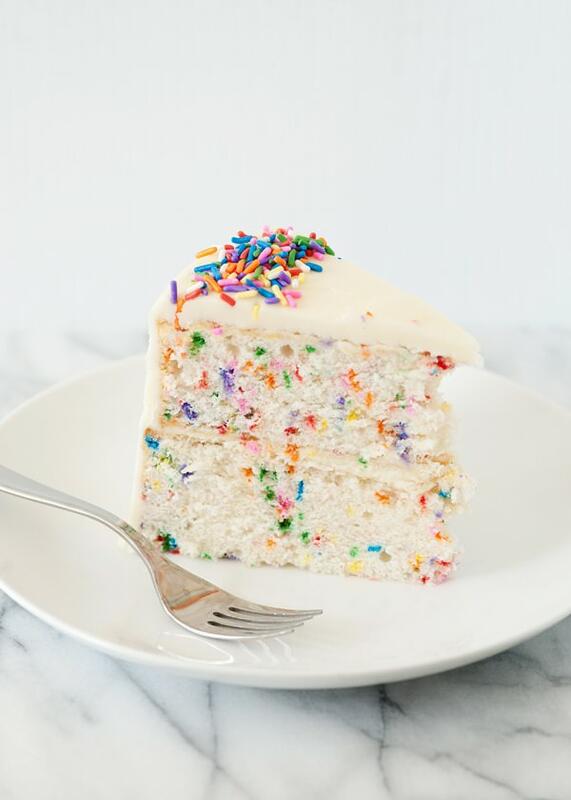 Is there anything more fun than funfetti cake? 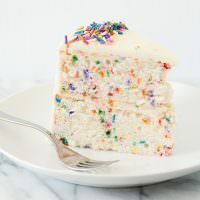 I have yet to meet a child (or adult or that matter) that does not love to see multi-colored sprinkles inside their cake. I made this cake for our annual First Day of School dinner party. I always make a big deal about going back to school. I feel like going to back to school is almost like a new calendar year. New beginnings, new routines, and a fresh start. I think that making a big deal about going back to school lets your children know that it is a really big deal. Almost every year, William requests spaghetti and meatballs. I always make a cake, but every year, I do change it up. This cake was a huge hit. This is based from Dorie Greenspan‘s Perfect Party Cake. It makes a light and fluffy cake, that it great for many kinds of frostings and desserts that call for a white cake, like a trifle. If you have never made a cake from scratch before, this is a great one to start with. It is simple and the worth the extra effort. I ended up having to make this twice because the first time, I turned the cake out of the pan, burnt myself, and continued to drop it on the floor. I hope that you have better luck than I do. I made a batch of my marshmallow buttercream and added some lemon essence to it. Essence is essentially extract, but you can find it in bakery supply stores. It is thicker than extract, and comes in a variety of flavors. It is fun to play with, but if you don’t have any, just use lemon extract. **edited to add** I have gotten a lot of question and comments asking how I got the cakes so flat. I used strips similar to these Bake Even Strips. You get the strips really wet, and wrap them around the cake pans. It acts as an insulator and helps the cake bake evenly and flat. You can also use strips of old towel (and no, they do not burn, just make sure they are really wet). Just drench them and wrap them around the pans and bake. They are awesome and get rid of the bump that you can get when your cakes bake. Sift together cake four, baking powder, and salt. 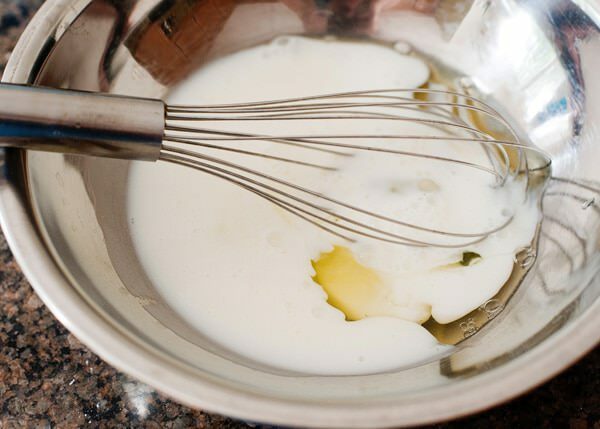 Whisk together buttermilk and egg whites. 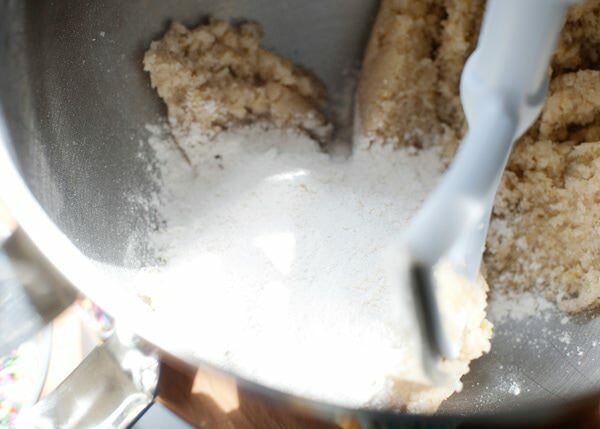 Put the sugar and lemon zest in the bowl of the mixer and rub it together with your fingers. Dorie says to do this, so I do. Add the butter and beat together until creamy, 3 minutes. Add 1/3 of the flour mixture. Add 1/2 of the buttermilk mixture. Repeat until all of the ingredients are added. Add the sprinkles and fold until combined. Pour batter into 8 or 9-inch pans that have been sprayed with cooking spray with flour. Bake at 350 degree for 30 to 35 minutes. Cool in pans for 10 minutes, then turn out and cool completely. Ice with frosting. I used my Marshmallow Buttercream with lemon extract instead of vanilla bean. Sift together cake four, baking powder, and salt. 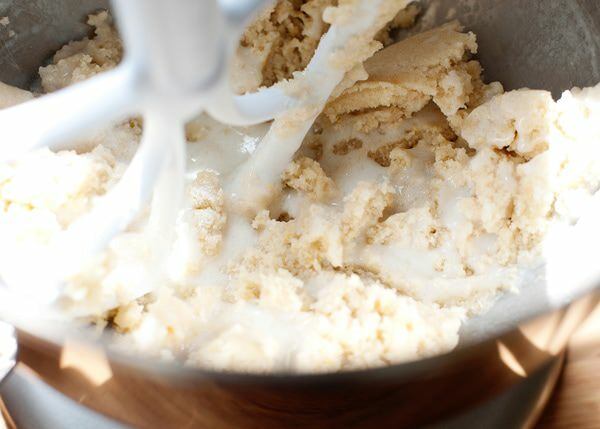 Whisk together buttermilk and egg whites. 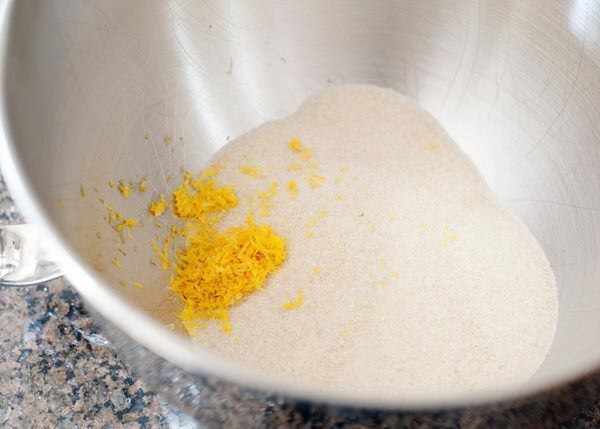 Put the sugar and lemon zest in the bowl of the mixer and rub it together with your fingers. Dorie says to do this, so I do. Add the butter and cream together until creamy, 3 minutes. Add the lemon extract. Add 1/3 of the flour mixture. Add 1/2 of the buttermilk mixture. Repeat until all of the ingredients are added. Add the sprinkles and fold until combined. Pour batter into 8 or 9-inch pans that have been sprayed with cooking spray with flour. Bake at 350 degree for 30 to 35 minutes. Cool in pans for 10 minutes, then turn out and cool completely. 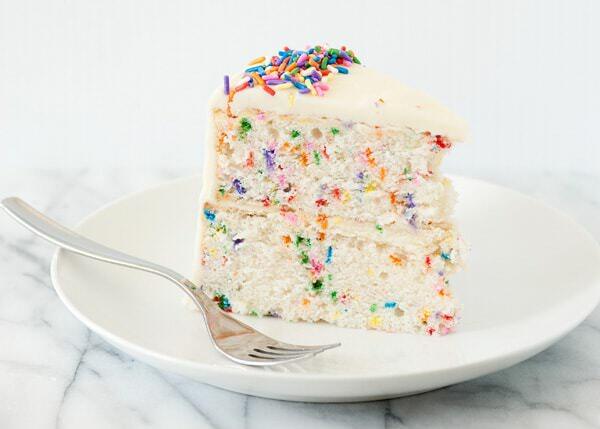 You are right, who doesn’t love a funfetti cake? They always make me smile! 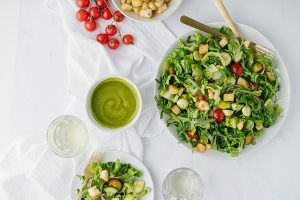 This sounds delicious and I am going to have to try this recipe really soon! Me too! Love how colorful they are. This cake looks amazing! I can’t wait to make it. Quick Q for you: whenever I bake cakes, they always rise in the middle and they never have the nice flat look yours do. Any thoughts or ideas? Thanks in advance and I love your site! I do Beth, I updated the post to share my secret for a flat cake. Was that the cool in pan for 10 min then flip over on cooling rack to finish cooling? Can you post a pic as well with a towel, I dont really understand? BEAUTIFUL cake, sorry to hear about the first one. Hope everyone had a great start to the “new year” this was sure to make it begin wonderfully! Thank you Diane! We had a great start to the year, I hope that you and your children did as well. What a cute cake! My niece is returning back from Paris so I totally need to make this as a welcome-home cake! She will love to come home to such an American cake! My former roommate and I would make funfetti cakes regularly and had a blast decorating them. Ours never turned out as beautiful as yours and we always made them from the box but there’s definitely something very comforting about funfetti. 😉 I love that you add lemon zest and buttermilk – I bet your cake is chock full of flavor; and wonderful for the kids on the first day of school!! That sounds like fun! This cake tastes better than some of the funfetti cakes of my past. But I do have to admit, I love a boxed cake. Ii have followed your blog for some time now and love everything you have out here! it is a beautiful blog with such tempting treats! Question for you!! How did you get your cakes to have such level surfaces? You are so sweet! Thank you Sarah. I updated the post to tell you how I did it. That is how I do it, every day is an occasion for cake. thanks Becca! I updated the post with how I made them so flat. what kind of cake pans do you use? they turn out the most perfectly shaped cakes!! can’t wait to try this recipe. They are pans from the bakery supply store, but it is the wrap around the pans that make it flat. I have updated the post with the info. If you bake your cake at 325 instead of 350 you don’t get the high dome either. Thanks for sharing that Carolyn! I do not see the updated post! I too wondering how you make it so flat. Thank you Rachel! A large offset spatula and lots of years of icing cakes. I used to decorate cakes as my high school job. I will try this recipe. It is so colorful and really easy to make. Love your cakes, could you please tell me where I could but the cake wraps. Or at a bakery supply store. 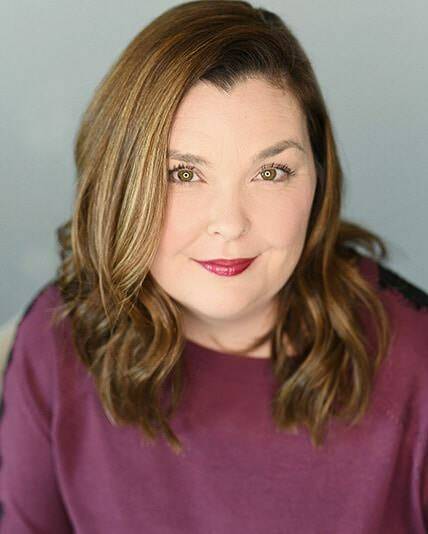 Thank you Amyallen! I updated the post with the information. So cute! 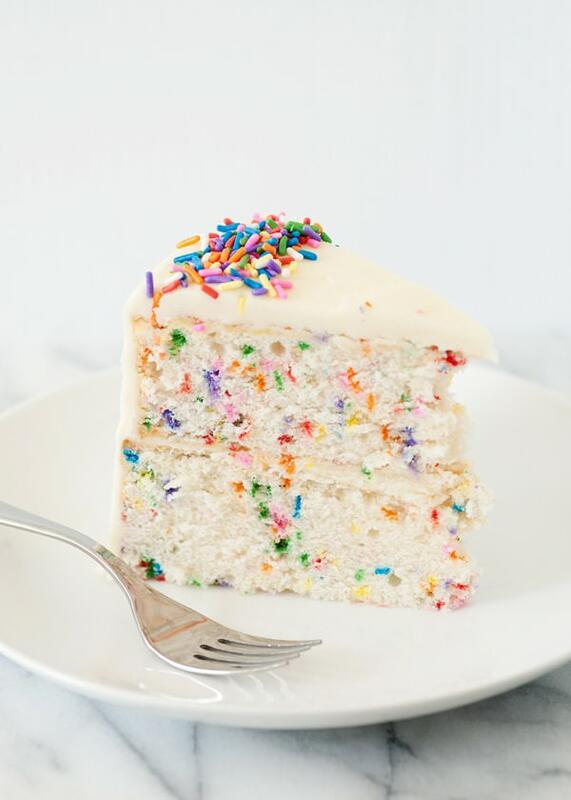 I like white Funfetti cakes because children absolutely adore this dessert! I like to make something similar for children birthday! Really nice post! Thank you! Kids of all ages love funfetti! Even 40 year old kids! How do you get your cakes to look so perfect? My goodness. Usually my cakes dome (usually just a tiny bit with a little mote thing going on around the rim) and the top gets kind of spongy and wet. It’s kind of weird. I am going to update the post so that everyone that commented will get the same answer. Hi thanks for thsi amazing cake.. looks simple to make but so effective… We will make it for my daughters 6th birthday party, and hire and #6 pan. We don’t get marshmallow creme here tho.. so usually just use a packet of marshmallows… Can’t wait to try it. I would just make a simple buttercream if you can’t get marshmallow cream. Just make your own! Reeni over at cinnamon spice and everything nice shows you how. This cake looks beautiful! Funfetti is one of my faves, but I’ve never made it from scratch. How did you get the perfect ring of sprinkles at the top? very impressive! I’ll have to give this cake a shot! such a cute cake! 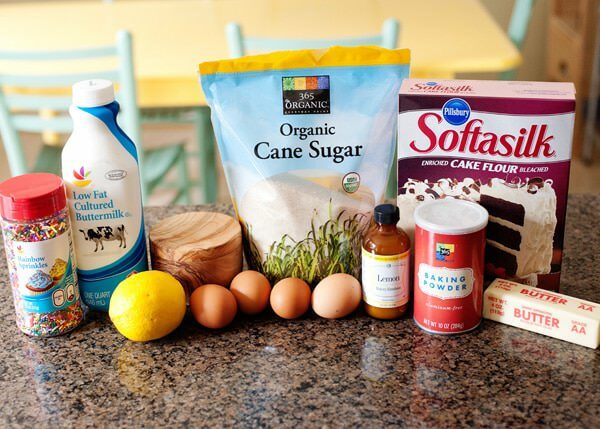 quick question on the frosting – do you add the lemon extract in addition to the vanilla extract just omitting the vanilla bean, or is it the lemon extract instead of both the vanilla extract & bean? It is however you want to make it, but I think that I just did lemon extracts. Will the towel wrap work on a 9X13 cake pan? I have never tried, but a metal pan should work just fine, but not sure about glass. Hi Bakedbree, Your cake looks so good. You mention about another method of wrapping a wet towel around the cake pan. Question is it safe? Wont it dry out and burn? I need to ask sorry if it sounds stupid. I have yet to burn my house down, so I guess it is safe. You make sure that the towel is very wet. It will be very dry and brittle when the cake is done. Amazing, thank you so much for that tip on making flat cakes! Hi – I wondered if the consistency of the cake is different when you use the bake strips to prevent rising? Just curious! I think so, but I have never made cupcakes with this batter. Do you need to secure the towels? Just get them really wet and wrap around? Sounds great. The cake looks amazing! 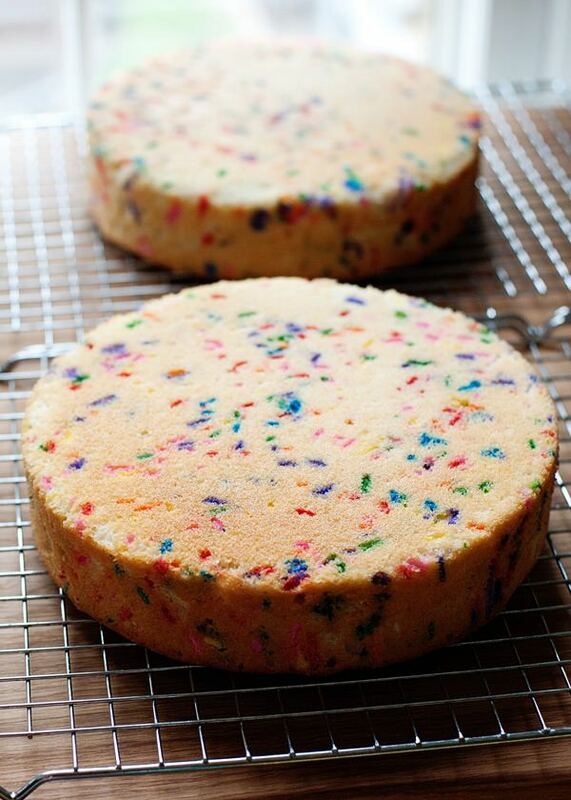 I love funfetti cake but would love to make from scratch. Thanks! I don’t secure them, if anything I just make sure the seam is next to the sides of the pan. I usually always bake them in a baking sheet. I have not done this, but someone wrote about paper towels working, so I am guessing that it would. Just be careful and make sure that the sheets are very, very wet. What can u use instead of lemon zest and extract? Would the amounts stay the same? Just vanilla if you want. Yes, the same amount. This looks awesome! Going to make this soon! Thank you! thank you! I hope that you do. Hi Bree! I’m from Spain and I always enjoy reading your tempting recipes! I really love them! Could I ask you a question? I’m interested about the dimensions of the cake, specially about the height. What’s the height of the cake? and what about the height of each layer of it? I used an 8″x2″ pan, so it is about 6 inches with the frosting. Pin away!! I love seeing my recipes being pinned. Thanks for sharing. I use baking strips but still get a bit of a dome. What temp is the water you soak your strips in? I’ve always used ice-cold, wonder if there is a difference… Thanks! I use cold I guess. I just really, really soak them. I used the strips and was using 8×2″ pans. It is an 8″ by 2″ pan, so with the layer of frosting, it is about 5 to 6 inches high. Really? I’ll have to check it out. My mother always used a pot. Who knew? Thanks for sharing that tip! I’m very new here and this cake caught my eye in Pinterest which led me to your website, which by the way, is brilliant!! Can I ask please – is it definitely egg whites because as I am looking through the photos above, I thought I saw egg yolks in the mixture? Sorry to be a bit silly but just confirming before I convert this recipe (I’m British) & bake this lovely recipe for my colleagues at the hospital where I work. Welcome Vanda! It calls for egg whites, but I used whole eggs, I forgot to separate them! I was baking at someone elses home one day, and tried the paper towel trick. It does work!! Wow great Cake – I am pinning this one to make in the future! Thanks for sharing! Thanks for the amazing flat cake tip. I have always wondered how people get perfectly flat cakes without cutting of the top. I pinned this and tweeted it! You are very welcome Lauri! I use wet dish towels and use big safety pins or paper clips to attach the two towels. The towels do not burn, but do become dry and stiff. You will bake a level cake using this tip. that is a good idea to keep them closed! So smart. What a gorgeous looking cake! How do you make them bake flat? I’m loving the recipe but that little factoid would change my life! I explained it in the post and comments. Hello, I just made this cake and it didn’t turn out so nice. But I am thinking I need to adjust for high altitude. The cake was to moist and would not come out of the pan. Do you have any suggestions? If you are high altitude, then you need to adjust. There are a lot of factors, so I can’t really say for sure. But did you spray the pan really well? I was wondering how it was with the egg yolks left in? I never seem to find time to make something with those yolks I save, and if it makes it a little more sturdy that would probably be better for me. Does it give it an eggy flavor? It was fine, but not as light and airy as it is with just whites. I made the Funfetti cake tonight for a family dinner we are having at our house this week. I followed the directions exactly. I took an old kitchen towel and cut it in strips. I soaked the strips and wrapped them around the cake pans and secured them with a safety pin. Once cooked, I let the cakes cool for about 10 minutes. The only problem I had was that the cake layers were so tender they tried to fall all to pieces! They were flat though! I managed to get them iced which helped to hold the cake together and put sprinkles on the top to add extra decoration. Have you had a problem with this cake falling apart or did I do something wrong? I have not had that problem. I wish that I could be more helpful. How long do you whisk the buttermilk and egg whites for!? Thanks! I can’t wait to make this. I don’t have trouble baking but I really struggle with making pretty cakes and cookies. How did you ice this and decorate it so perfectly?? Thanks for the recipe! Can you use all purpose flour instead of cake flour? Where do I pit the strips of wet towels? Inside the pan? And then pour the batter? Do I have the still put flour inside the pan? Also, do you have this recipe scaled up for a 12 inch round? Or tie it in a knot. a towel, even soaking wet, does not catch on fire in the oven?? Otherwise, I’m excited to try this! No it does not, if it did, I would not have suggested it. Help! What did I do wrong? I toothpicked it at 35 min and it seemed a little gooey. I left in another 10 min but top started to brown and i didn’t want to burn it. I let cool and flipped but bottom and middle were not done. So I put them back in pans upside down and popped them in for another 20 min. This was my first non box cake attempt and I feel like I failed. I did wrap sides with wet strips. I was excited to see no poofy top but now I wonder if it is bc it was not done. Any suggestions for next time? It sounds to me like you have a problem with your oven, rather then your ingredients. Pick up an oven thermometer next time you’re at the grocery store. They’re inexpensive. Then you can test your oven and know for sure. Making a cake from scratch is almost as easy as making one from a box. The only difference is a couple of minutes of measuring. Check your oven and keep trying. Ok, I read on a little bit more and I can see you put the strips on the outside! How do you make the strips stick to the pan though? Will foil paper do? I would like to ask you something.. Here in canada, 1 strip of butter is pretty large.. so I was wondering if you could be more precise for me on the quantity of 1 strip? 1 stick of butter is a half a cup. 1 stick of butter is 1/2 a cup. So American butter comes in packages of 4, each stick is 1/4 pound. So the recipe would call for 1/4 of a Canadian block. Right ? I have no idea what a Canadian block is. But each stick is 1/2 cup. Yes 1/4 of a block. The “strips” – I think it would be easier if you bought Wilton Bake Even strips. You can get them in most hobby stores and you web them, then you wrap them around the cake pan. They come with pins to pin them into place. Has anybody made this cake in high altitude? If yes, please let me know what ingredients I need to adjust. I have not, I wouldn’t even know where to start. I live in Colorado. Most recipes call for 3 to 4 tbsp of extra flour for altitude. HI! I found your blog through Pinterest and think it is just LOVELY. I love the layout and design and your photos are lovely! I’m a new blogger and would appreciate any advice you have on making my blog as lovely and successful as yours! Welcome and thank you! My advice – photography is important. Learn to take great photos and people will come and stay to read. Best of luck! Bree, it’s gorgeous! Thanks for remaking it despite your burn/dropping situation….Gah! That sounds like something I would do. Pinned! Thank you Averie! I had a bunch of kids coming for dinner, I could not disappoint! I am going to try this soon!! I wonder how much vanilla I would add if I wanted to leave out the lemon zest/juice? Probably a teaspoon or two. This cake looks amazing and I can’t wait to try it out, thank you for sharing!! That is how much I would use. Hint for High Altitude. We just moved from Colorado Springs (Thank you Army). We lived at the AFA (7258ft) and Ft. Carson (5835ft). Baking at the AFA was much trickier. My friend had a great cake recipe and I had to adjust the egg nog (buttermilk for this recipe). Look at the picture where Bree adds the sprinkles to the batter. Take notice of how the batter looks and how it clings to the side of the bowl. Make to directions at first and then add buttermilk till you hit the correct consistency. It shouldn’t be more then an additional 1/4c. Then just keep an eye on it while baking. I hated baking in the altitude. I got ribbons for my pies and burned them there. So glad to now be at 737ft now. thanks for sharing the tip to make cakes flat. i didn’t know about the strips. It is a cook tip. Can you explain the towel? Do you just use an old ripped up towel and get it wet and stick it to the sides? Does it not burn? It does not burn, that it why you get it wet. I’m a little new to this. I don’t understand the wet strips. =( Where exactly do they go and how do you get them to stick? Wet the strips completely and wrap them around the cake. You can tuck them in or tie them. Hi! What a pretty cake. I would add that you could use a metal flower nail in your cake too. Invert the nail in the center of your pan (I use several nails for the larger pans) and pour the batter in after you place your nail. I always line my pans with parchment paper or spray them with a flour based cooking spray. The reason that wet strips on the outside or a metal flower nail work is that they allow the heat to escape the center of your cake. This allows your cake to cook at the same rate all over. Whenever you use these items, you should lower your planned cooking temp and increase the cooking time. You might want to experiment with which of the above cooking elements you want to use, or try them in combination. Happy Baking. What is a metal flower nail? Need to check that out. A Flower nail is what cake decorators use to make roses and other icing flowers on before they put the flowers onto the cake! Here is a link to Wilton’s metal flower nail! So do you put it upside down into the batter so the nail part comes out the top? A flower nail is a tool used for making decorative icing flowers for cakes. Its a little pedistal you form the flower on and then transfer the flower to the cake. You can find them wherever cake decorating supplies are sold. I think that I have one somewhere, I need to try it. I bake a lot of cakes from Wilton shaped cake pans. Have you ever used the strips on cake pans with irregular shapes? Would they work if there is any air between the strip and the edge of the cake pan? I have not, I really don’t know. Sorry I cant be more helpful. I have used metal paper clips for shaped pans. (You know, the black clips with the fold-up silver parts you pinch to get it to open). I will cut strips of a cotton towel just wide enough to reach the top of the pan to the bottom. The use the clip at the top to hold the strip up and in place. Works like a charm! Hi, Bree! Was wondering about making this as a quarter or half sheet for my daughter’s 1st bday (THIS weekend!! )–I’m thinking I’ll put a little batter in a 6″ round pan for “her” cake, and then make a flat cake for the rest of the fam–like 20-ish people. Do I need to double your recipe to make a half sheet, and any thoughts on baking time/temp? I am guessing at least double, but I don’t really know. I’d like to know what kind of pans you have. Even the last Wilton pans that I bought had slightly angled sides. I don’t know what anyone would ever think that’s a good idea. They don’t have a brand name on them, but I bought them at a bakery supply store. 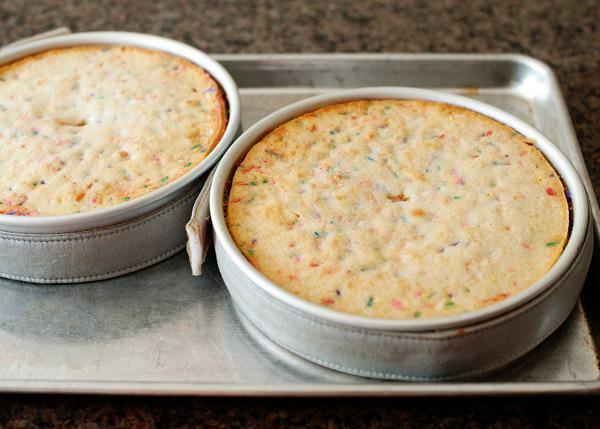 I found you through Pinterest and simply must try this trick to get cakes to bake evenly!! I have never heard of those Bake Even strips. I think I’ll try the wet towel technique first and if it doesn’t work then I’ll add these Bake Even strips to my Christmas list. So glad to have come across your blog! Welcome Holly!I love this tip, I use it all the time. Hi l am from Australia and l just made the cake (trial run), and noticed the sprinkles ran after baking so you can’t notice the sprinkles as much. How do l fix that or is there a type of sprinkles to use? They are going to melt, they are made from sugar. just a note: your recipe doesn’t have cream listed as an ingredient yet your recipe instructs you to whisk the cream. Please correct this. It says to whisk buttermilk and egg whites. It does say to add butter and cream together until creamy.. yet you don’t list cream in the ingredients. I am going to change this wording… it is cream as a verb, not a noun. It is cream, verb – not a noun. I mean to cream the butter and sugar together until creamy. This cracks me up! 🙂 Apparently some folks are new at recipes 🙂 Don’t lots of recipes call for “creaming” the butter and sugar? 🙂 Too funny! Me too, but they are learning, so I appreciate that they are trying. There you go! Game changer! For the frosting, do you skip the vanilla extract too, or just the bean? I am making this cake for my one year old’s birthday brunch Saturday. Thanks for the recipe! You can add whatever you like, I like vanilla extract with the lemon. If you didn’t want to use towels… Where do you purchase the official baking strips that you used to make the cakes bake flat? I tried making this cake twice this weekend…I have to say that the flavour is fantastic! Not to mention all of the compliments and happiness that comes from anything with sprinkles! I did have a little bit of difficulty with my cakes not rising…both were quite similar in result, with more of a dense texture to them comparable to a pound cake and not properly rising. Can you think of something I may have done incorrectly, or can adjust in the future? I did read and re-read the recipe several times to make sure I had followed your instruction accurately. Have you had this issue before? I guess I expected more of a fluffy, light texture. 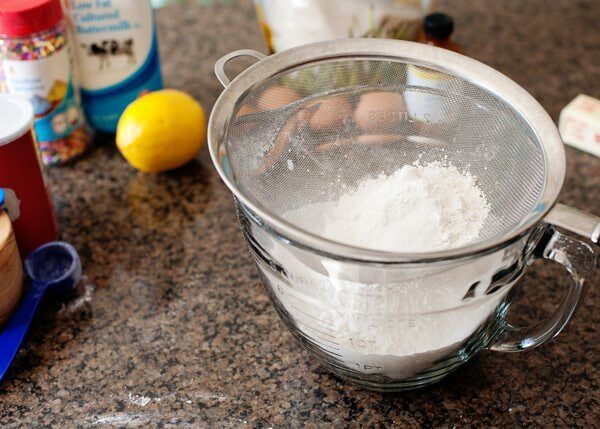 How old is your baking powder? I have never had this issue, the cake should be light and fluffy. I will let you know if I fail again, but I think you nailed the issue on the head. I go through more than the average person, but I replace mine every few months. It costs next to nothing, so I don’t feel bad about throwing it away versus having my baked goods not work. Hope it turns out better the next time! Just wondering if the round style of sprinkles(they look like confetti) would work instead of the ones that you have used. I couldn’t remember which ones to get at the grocery store and bought the round ones by accident! I don’t see why not, but I have never used them. So I just moved to the states and I am a baker, so for me this is like being in heaven 🙂 however I have a question, where can I buy those baking strips? and do they come in sizes or only for the round cake ones? thanks! There are links in the text of this post. But I got mine at a bakery supply store. Sometimes Michaels has them. I am just making the cake, and so far it looks yummy, except that my sprinkles bleed the color and my batter is no longer white. this is a great recipe! i made it last night but converted it to cupcakes (i got 26 beautiful cups of joy) and it turned out fantastic! the cake is perfectly soft, thick, sweet, but not overbearing teeth-hurting sweet. the marshmallow frosting is also fantastic (and so easy!). the sprinkles did bleed, but it just made the cake more of a rainbow, so i have no problem with that. i can’t wait to make this recipe again! thanks for sharing! Hey Bree… fun recipe. No questions about butter. (I live in the states) Understand the difference between cream, creaming and getting creamed by little brother (long ago). I’m a pretty experienced cook. So what brought me here were the bake even strips. I’ve never had the problem that would necessitate my buying them. What I’m really wondering is the flatness. You said you used the bake even strips to get that result, too, but let me understand this. The even cooking makes the cake flatter, too? Does it make the cake any taller or do you simply lose the height and the bump? It makes the cake completely flat and no humps at all. Without them, I’d usually have to cut some of the top off to make it even enough to ice. When you use the strips, you don’t have to do anything to it. A first day of school party is one of my favorite things to do with my kids every year. I hope this becomes one of your family traditions too. I never found the Lemon Essence but found Lemon Bakery Emulsion by Lorann, is that what you used? Just to clarify you only use that in the frosting. The frosting does not get Lemon Essence (Emulsion) and Vanailla, just lemon. The cake gets the lemon extract. That is the same thing. The frosting can use whatever flavor you want. I like lemon in everything, but you can also use just vanilla. I just want to make sure I’m understanding correctly…you use the baking strips or towel around the outside of the pan right? I am not sure. I would try using towels. Maybe it is the pans? Maybe they don’t conduct heat very well? Bree – found your tutorial via Pinterest and I wanted to let you know how much I loved it! Also now on the hunt for Bake Even Strips. I’m so excited to make this cake for my sons birthday this weekend! I just want to clarify that the recipe calls for egg whites only. In the photos I thought I saw a yoke. Yes, egg whites. Please read through the comments, this has been answered many times. What cake pans did you use? Simply beautiful! May i ask what cake pans you use brand and size. I only have one old pan and I love baking but am finally making an investment in kitchen wares, I usually have avoided doing very many cakes but will enjoy not slicing the bump of anymore thanks for the wilton strip tip! I use pans that I bought at bakery supply store. The are heavy, but do not have a brand name on them. I have many sizes, 6, 8, 9, and 10 inches. I have the bake even strips and they look just like yours in your photo. They do not work. The very first time I used them, they did help the cake bake even but haven ‘t worked since. Why do you think this is? Do you wash yours between each use? Maybe it is your pans? And no, I do not wash them. Hello Bree. I came across your blog yesterday and decided to subscribe. I immediately bookmarked a recipe. This morning I saw this cake on Pinterest, and well now I have two recipes to make. Thank you 🙂 I really want to make a funfetti cake. I don’t like using a box mix so I was really pleased to stumble across this ‘from scratch’ recipe. Thank you for sharing your method and helpful tips. I love your blog, ideas, photograph, writing etc. I hope you have a lovely weekend. How do you measure the batter to the pans so that one cake is not thicker than the other??? I estimate, and hope for the best. If you want to be really particular, you can weigh the pans. I suspect that the insulating strips don’t work as well on cheaper cake pans, LOL. I’m looking at the thickness of your pans and they look more professional than the ones I bought at Target! Thanks for the tip on the strips and I should probably invest in some higher quality pans in order to achieve higher quality results! I will say that my pans were not expensive by any means, maybe 12 dollars a pan? But yes, they are thicker and nice flat sides. I got them at a bakery supply store, but they do not have a brand on the bottom. I thought this was supposed to be about making a flat cake. There is nothing here about how to make the cake flat. Perhaps you should try reading the last paragraph in the headnotes. I am sorry that you feel that way. I have answered the same questions over and over in this post, and I feel that I have been very patient. When there are 238 comments for a post, there is a very good chance that your question has been asked and answered already. This is a free website, and as much as I love and adore my readers, I cannot answer every single question, especially when it has been answered multiple times. I think (I hope!) that Ellie was meaning that Rob was being rude. HE was. You were not. You were to to the point. I like that! People who make rude comments without reading the previously posted comments annoy me. They also come off looking ridiculous when what they are complaining about has already been covered! O.K.. We understand , but how do you bake it flat? Really people…..the cake is gorgeous and looks delish. If you came here looking for how to bake an even cake….then read the whole article. She clearly posted it for all to see. Some people can be such a-holes. No, you’re rude. You people should learn to read. Or use the ctrl + f function and search the word “flat”. Seriously, what ignorance. Bree– yoou hvae convinced me NOT to follow your post. Instead of thanking all those who have clicked on your site– interested in learning from you, and yet you exclaim that you can’t be bothered with customer service? If you were my employee, I’d fire you. Just sayin’. Have deleted the pin, as I do not condone such intolerance with no appreciation from your part. Get off pinterest. I am very sorry to lose you as a reader, but I do not feel like I am “not bothered by customer service”. This is a free website, that I manage 100% on my own. I answer every single comment and email that readers send me, and I take the time to provide good and accurate content. That being said, I cannot spend all of my time answering the same question over and over again. If I did that, I would spend my time managing comments and not in my kitchen providing new content. I absolutely love my readers and am honored that they come here as a resource. Wow Bree… you give all this free info and your time and energy. Some people just love to complain. Don’t worry about losing them on pinterest or your blog, you don’t need followers like that. Thank you for your efforts. 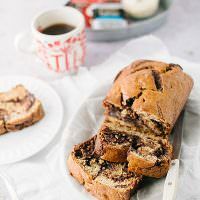 The problem isn’t the blogger, it isn’t the post, its the fact that someone pinned it for themself with the caption about this post being about baking a flat cake and it’s not, this post is a recipe for a Funfetti cake and the blogger happens to use a product to achieve a flat cake in the process. All it takes is a little bit of careful reading to find the information about flat cakes or doing a search on the page for “flat”. The blogger is probably slightly annoyed at the fact that not only has the question been asked and answered, but it continues to be asked despite the post being edited to deal with the flat cake issue directly. The blogger didn’t have to edit her post to fit the pinterest post, but there it is with a link to the product. BakedBree – maybe just put a highlighter on it.. If you came here because Pinterest had a caption saying this was how to make flat cakes you need to realize anyone can change the caption on Pinterest. I have seen a lot of misleading captions, best to check the website before repining so as not to be misled. It helps if you read the post. The information is there. I didn’t see it at first either until i saw the rude reply to your question. Being on Pinterest, you come across a million blogs and half of each blog is people trying to be witty and has nothing to do what I’m looking for. So I’m sure many people, like myself, just skip to the actual instructions. If i read an entire blog every time I’m looking for a “how to” I’d be reading blogs all day. I appreciate that, I really do, and can completely understand where you are coming from. But if you choose to make something and don’t read through, then I really can’t be responsible for the outcome. A lot of great suggestions come from the headnotes and comments from other readers. And I didn’t see it either until I saw her rude reply and further more I do not read all the comments that are posted from other people I do not have the time so if I post the same question that was posted let’s say 100 comments before mine oh well. This is a comment and question blog I know that u are busy but don’t allow people to ask questions if you get tired of answering them. It’s not professional to get rude with someone whom is one of your readers and obviously likes your ideas you should be flattered and not rude. There is this wonderful feature on your browser. If you hit ctrl+F (or command+F for mac users) you can search for the term you’re looking for. It’s a shame that people are so lazy they can’t be hassled to actually put forth effort, and blame the author who has generously and FREELY shared her tips. Anyone can post anything on Pinterest with any caption. You can even change the link after posting, so it takes you to a different site than the picture features. Get over it. if you read the whole tutorial it says to wrap the cake pans in a soaked towel while baking. I am in Denver, any suggestions on high altitude? Sorry, I don’t know anything about high altitude! if you cut the top and bottom out of a soup can sempty and cleaned of course, spray and flour the can tube, por your batter in your cake pan, insert can hole up, and hole down(no mis info here, and bake. this acts as a heating core through out your cake as to bake evenly and flat. cool cake and remove insert fill the hole with the cake thats inside if its tuck in there. sometimes it will come out clean. You can also buy something that serves the same purpose from the brand Wilton. I have it, but I do not use it…but probably will the next time I make a very large cake. The bake even stripes and hearing core are both developed by Wilton. You can purchase them through most craft stores, like A.C. Moore. As she said, the bake even stripes need to be moistened and wrapped around the outside of the pan. For the hearing core, spray both the outside and inside with Pam, put the core in the center of the pan, fill the pan about half way, fill the heating core about a third of the way. When the came has finished baking, before you decorate, use the plug of cake in the core to full the hole. I live in the uk and we do not get cake flour as such just plain and self raising, which would be the best to use for your funfetti cake? Also think our butter might come in different size packaging how much should I use? Our butter is 8 Tablespoons, or 1/2 cup. Wow this is so useful! Is plain flour the same as Canadian all purpose flour? You have wonderful recipes by the way. yes. I use all-purpose unless otherwise stated. Also that tip about the towels is neat. I’ve always just taken a knife and sliced the hump off. I am in Europe right now, so I feel your pain. Hope the above info helps! You are? What are you doing in Europe? THIS CAKE IS SO CUTE AND DELICIOUS. KIDS LOVE IT! How cool is that. Do those strips work for rectangle pans? I have not tried, but they should. They do. I just attach two of them together. They also come in two sizes. They do. You may need to secure two together, but they work on rectangular pans as well. I have got to get my hands on those bake even strips… or better yet I need to cut up an old towel! Who would have thought!?! Thank you for enlightening me today! And the cake is making my mouth water! wow I kinda feel ripped off for not knowing anything about these magic cake bake flat thingys. All those cake tops!!! Wondering how my wedding cakes werent tidied but yet so unbelievably flat!! And I just thought it was luck of the draw!! Insane!!!! Gotta totally look for those strips for the pans! Thanks for putting that out there! any place that sells Wilton products should have them. Loving this cake! Your pics are so bright & recipe very easy. Going to make this one for my sons birthday in a few weeks. Your presentation is perfect, can’t say mine will turn out the same!!! As for those strips, I haven’t even heard of them so will get them from Amazon (thanks for the link) if I can’t get them in Australia anywhere….. Whenever I’ve wanted a flat cake, I take a knife to the top!!! You can get them from most good baking places or http://www.bakingpleasures.com.au (I am not affliated with this shop at all) they get all the good stuff in from the US! Are the cake pans supposed to be placed in the oven directly on the rack or placed on a cookie sheet first (like in the picture)? Sorry if you’ve already answered this. I’ve gone back and looked at some of the previously asked questions, but didn’t see an answer. Either works, but I like to use a pan to make it easier to get in and out of the oven. The cake is beautiful. I’ll have to give it a try. And thanks soooo much for the hint on getting the cakes to bake flat. Now I won’t have to slice off the bump! Brilliant! Hi! Gorgeous cake! I’m going to make a similar one for my daughter’s birthday in a couple weeks. What brand of sprinkles did you use? The colors are so much brighter than the ones I’ve found. I really don’t know. They came from Target? Hi Bree! I love your blog! I’m making this for my four year old’s birthday party this weekend. I’m debating the lemon extract vs vanilla. Is it a very lemony flavor? Thank you! I don’t think so, I just bright. Either will be fine. Thanks for the tip for baking a flat came, I really need to either try the towel or buy those strips as I hate when my cakes come out with that hump and then I need to trim it. Thanks for the help on flat cakes! I repinned it on Pinterest if that’s ok. Linked back to here. The reason I repinned this was due to your explanation on how to make the cakes flat. I don’t understand how people can miss the explanation: You are not rude. I am going to buy these strips for my daughter as she is making all kinds of wonderful cute cakes. I have seen these before but never bought them, thought they just might have been a “gimmick”. I will definitely buy them now! Thanks so much!! No, it is not. Please read the rest of the comments, I have answered this a few times already. My Mom taught me the key to a successful cake is good cake pans + grease and flour. No cooking oil, no spray. Old school crisco/flour. Great, got that mastered. Now along comes the solution to a flat cake! Thank you, a thousand times, thank you. I am cutting up a towel and baking a cake today! BTW, your funfetti cake looks AWESOME! I see that it says that i can use old an old towel to make the strips can i use cheesecloth instead or will the cheesecloth burn or is it not heavy enough? I don’t think so, I think that cheesecloth is too thin and would not insulate enough. Thanks for taking the time to post how to make a flat cake. I have never heard this before. Great tip! are you getting the strips wet before you put them around the pan? If so it could be the brand of pan you are using. So, has anyone tried the old towel method? It doesnt catch fire or anything during the time in the oven? Yes, I have. It does not burn. I really don’t know what to tell you, I have never had that problem and I make cakes all the time. Even when using the wet towel strips, it has not happened to me. I wish that I could be more helpful. Make sure to prepare your pans correctly before cooking-flour and Crisco. Also make sure you are waiting the correct time to flip them out. Hint- I use coffee filters for the bottom of my pans after I have used Crisco, they come off the cake perfect. No cutting circles out of parchment paper. No, I did not double the recipe. I am sorry that yours didn’t work, but I am not sure why not. It is a Dorie recipe, so it is very reliable. Sorry! Hey! I’m just wondering, would this cake be sturdy enough to put fondant on? Sorry if the question has been asked already. I don’t see why not? It is not as sturdy as a pound cake, but it should hold up just fine. WOW, who knew about these strips? what a well kept secret! Your cake looks fabulous! off to see if these strips are available here in Scotland. thank you! I thought your post was very clear and absolutely a yummy looking cake. I am going to have to get some of those strips! Certainly gonna try the wet towel tomorrow when I’m baking my carrot cake! Gina, check the expiration date on your baking powder. I ruined a whole bunch of Christmas cookies one year. My baking powder had expired a year earlier. I think when the caption on pinterest under your cake picture says…how to get cakes to bake flat . now you know….maybe your first thing on the page should have been about the strips and not the last paragraph…people are interested in how to get the flat cake I think not so much the cake recipe itself….but all in all good tip. I will surely try it . I want to ask how do you stop mixture from curdling when adding buttermilk and egg white mixture? I tried a recipe of white cake from some blog it required similar way of adding egg whites. When i added it was fine in the beginning but totally curdled by the time i used all the liquid. What could i be doing wrong? I think that you need to keep beating it. Usually by the time all of the flour is incorporated, it comes back together. HOLY TASTEBUD HEAVEN!!! This recipe is for sure a keeper & soon to be staple for all birthdays! Thanks for sharing your amazing recipe! Also love the photo steps! Was probably answered, but how do you keep the towel strip from falling off as it dries in the oven? or does the 8-12 minutes for most cakes not dry the strip out enough to fall off? I was thinking, that since I only have one size cake pan(Aside from bundts) that I could sew it to fit snug, since I think a safety pin would get too screaming hot to use and defeat the purpose of the insulation and then end up with a burnt mark or one extra cooked side. I would Ctrl-F this but that only works well for one or two word searches. About how thick are the strips suppose to be if I use old towels? As thick as your pan. Just a head’s up, the sprinkles most likely make it not “technically” vegan. I would never have thought of it until I worked with a very vegan guy and made him a cake with sprinkles and he questioned it. Sure enough, the red dye is insect derived. Go figure. Hi! Lovely recipe. I’ve just run into your website and it’s super cute. Our sticks are 1/2 cup or 8 Tablespoons. Holy lot of backlash, haven’t seen so much drama about cake since Marie Antoinette! I am excited by this tip, the only draw back of not having to cut the bump off is that you actually have to wait till you serve the cake to taste it. No more free samples in the kitchen! I dont think I saw this question already asked. However, can you make this into a chocolate cake? I have made it your way, and i absolutely love it! Its a great base cake to add different flavors!! Everyone i have made it for also loves it!! Thanks in advance!! Omg how interresting! Thanks for posting and the cake looks delish! Sorry about all the lazy people who cannot read… Great tip!!! You have to read the top portion. It is in italics. I can’t find it either – there is nothing about making it flat??? I live for Rainbow Sprinkles and can’t wait to make this recipe!! Jesse….I didn’t find her answer “testy” or rude………………..maybe you are having a bad day or something,because personally I find your comment to be rather “testy” and insulting………………or maybe you are having a person dig,I don’t know but you come across very nasty……I don’t think you have any valid reason to say what you have ….sad. I must agree with Becky….I did not find Bree’s answer to be “testy” at all. I too wasn’t expecting the recipe when I clicked on the link for creating flat cakes. However; when I saw the recipe and instructions I knew that somewhere in the post I would find the answer…and I did. For those that didn’t find it as easily, I believe that Bree answered the question very politely and I could even imagine her smiling at her own unintentional “Where’s Waldo” instructions on creating a flat cake. I appreciate her being on a free blog, as with the economy the way it is, if I was paying for a cooking ideas blog it would be one of the first things I cut from my budget to save money. Thanks for all your ideas Bree. I’ll let you know if my 12″ x 18″ cake turns out flat using the towel strips idea. I’m so going to bake this. Looks absolutely delish! Bree, A spectacular post. I don’t pretend to be a baker on par with you. I love the tutorial on flattening the cakes. It gives hope for these unsteady hands and for learning the art of decorating. Thanks so much! We are twins! I am Bren Bakes, we have the same recipe, the same salt cellar, same organic sugar, same heat resistant strips, whip and stainless steel bowls! But, I never tried the confetti in cake ! Thanks!!!! Hello there, great recipe, but does high altitude affect the recipe? Do I need to change anything when using this recipe? Thanks again! I am not sure, I have never tried baking in high altitude. I would do some Google research and see what adjustments you might need to make. High altitude absolutely requires changes for cakes. Visit the King Arthur Flour website, they have charts with the adjustments you’ll need to make for your approximate elevation. Fahrenheit. No, all-purpose. And a stick of butter is 1/2 cup. Thank you so much.I never heard of baking strips before. I love help in the kitchen. I tried a similar recipe for my friends birthday cake but it didn’t seem to work. I’m from the UK so instead of converting all the cups stuff into grams i just used a regular white cake recipe (Don’t know if that makes a difference) and baked it in a silicone tin. I put in roughly the same amount of sprinkles but when i took the cake out it came out of the tin all broken and half of it was stuck to the bottom. Also there was no colour to the cake, i think all the sprinkles melted or something. I really wish that I could help you, but I don’t know what happened to your cake. Oh well thanks anyway… I guess I’ll give it another try and hopefully I can fix it! Sorry! Make sure you use enough spray or grease it. To avoid stuck cake. Wilton makes a cake release liquid that works well. Brush it on in a thin layer inside the cake pan. Also only let your cake cool 10 min in the pan. Then invert it onto a rack with parchment paper to cool fully. Isabel, I think might have happened is you might have overcooked your cake just a smidgen. Try taking it out a little bit sooner and see if that helps. Here’s a tip that I use all the time, just cut a circle of parchment paper, works every time to stop anything from sticking to your pans. Hope this helps. Cake release is amazing stuff! And I use the wet strips all the time. They work! Not entirely sure where your poor sprinkles went! Did you beat them in with your mixer or fold them in by hand? Maybe that makes a difference. I would fold them in. My sister and I use to make great cakes that had one flaw: they stuck to the pan! So we finally tried parchment paper on the bottom of the cake pan and it worked like a charm! Not one crumb stuck! Followed this to the “T”, twice, didn’t work. Not sure if your towel theory is the issue. Considering your “towels” are obviously not just torn towels, but smthg is off. Isobel, when I moved from America to Ireland, I found I had to add extra flour to my American recipes. I think it has something to do with a difference in how the flour is milled. Try using 2 3/4 cups flour instead of the 2 1/4 in your recipe, and also try it in a traditional tin lined with baking parchment..
Any help with cups to grams conversion. Looking it up but it is all a little confusing. Would buttermilk count in the syrup, honey section? I think that a scale is the way to go. Buttermilk is sour milk. Hi Isabel! I’m also from the UK and I bake and decorate cakes for a living. Even when using silicon pans (which I don’t if I can help it!) I will alway place a sheet of baking paper to the bottom of the pan and spray the pan and baking paper as well very liberally with a oil spray ie fry light or just a cake release spray will do it! But I will also say that when you do use a recipe that has the cup measurements you really must convert. I’ve had so many recipes fail where I try out using the cup method but nope no good! It’s very easy to covert online now so, give it another go! Do you have an oven thermometer? A lot of ovens become hotter than they should and this could also explain baking troubles. Bree, I read the whole article, all 300 + comments looking for the Marshmellow icing recipe. Did I miss it? If I did just tell me to read it all again lol. Does this end up tasting “lemony”? I guess it depends on what you consider “lemony”. It has a lemon flavor. Hi there! This cake looks fabulous! I was curious roughly how many cups of batter it makes? Thanks! Secondly, you can easily calculate approximately how many cups a recipe provides by adding up the weight of all the ingredients combined. Then, you can consider about 8 oz per cup. The total weight of the above recipe is approx 45 oz. That should be a little more than 5 cups of batter. Cake flour is about 3.5 oz per cup; large eggs are about 1.7 oz each, a stick of butter is 4 oz, sugar is 8 oz/cup, as is milk. See? Hope that helped! Keep baking! Have you tried baking this recipe as cupcakes? I’m trying to figure out how long I should bake them. Suggestions anyone? No, I have not. I’d start at 18 minutes. A trick to baking cup cakes is preheat oven to 350F, fill tins/liners 3/4 full; reduce temp down to 325F and bake for 25 minutes, but check at 23 minutes. I get perfect cupcakes every time. Probably the yolks. This recipe calls for whites only. Hi! I was wondering if you think these would turn out well as cupcakes, too. Also, I am not a fan of lemon. I know that the zest brings out the flavor and you can’t even tell it’s there. In my case, would you suggest leaving out the extract? Finally, what does the buttermilk do that regular milk won’t? Thanks in advance! I have never made this recipe as cupcakes. Please feel free to try it out and let us know how it goes. 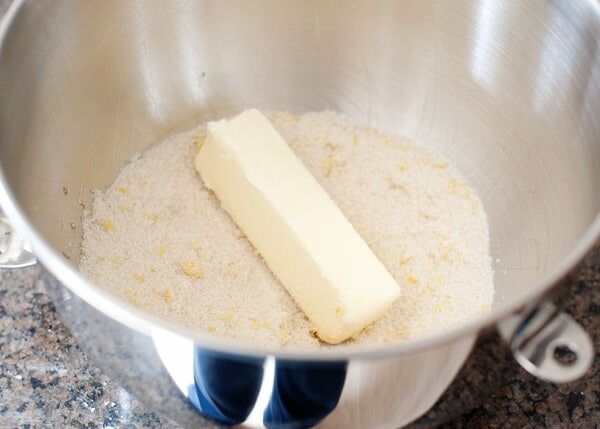 Buttermilk makes a tender cake. If you want to use regular milk, go ahead, but buttermilk is great in baking. If you don’t want lemon leave it out, or use vanilla. I love this recipe! So cute and colorful. Thanks! How much does a ‘stick’ of butter weigh? I am in a different country and we can’t buy ‘sticks’ but ‘slabs’ here. 1 stick of butter is 1/4 pound. You can also bake the cake layers at 300 and they will come out even, same amount of time. Copied and pasted from the notes: **edited to add** I have gotten a lot of question and comments asking how I got the cakes so flat. I used strips similar to these Bake Even Strips. You get the strips really wet, and wrap them around the cake pans. It acts as an insulator and helps the cake bake evenly and flat. You can also use strips of old towel (and no, they do not burn, just make sure they are really wet). Just drench them and wrap them around the pans and bake. They are awesome and get rid of the bump that you can get when your cakes bake. I tried this recipe for my little girl’s 3rd birthday…the even bake strips were really useful, the marshmallow buttercream was really enjoyed by her little friends and the adults really loved the lemon flavour…however, my multicoloured sprinkles didn’t have the desired effect with the multicoloured little dots in the batter after baking…all the different colours seemed to have melted even before placing the cake tins in the oven…and even more so as i sliced the cake…there were no little colourful little dots 🙁 The cake was very tasty and gone very quickly but I was a little gutted it hadn’t turned out exactly like it was supposed to… do you have any idea why? The bottle of sprinkles says “Decor Sugar strands” and the brand is Dr Oetker. Maybe they were smaller? I am not really sure why. Sorry! That’s ok, I don’t think it was anything to do with their size as they were just pretty standard decorating sprinkles…I’ll try and figure out why by trying different ones. It was a very successful cake in every other way though! I always come to your blog for recipe ideas 🙂 you create some yummy things…just read your “slice of bread on cake tip” on a different recipe and I’m so pleased with it as i hate having to wrap my cakes up in cling film so they don’t become stale overnight! Now that won’t happen anymore! Susana, from Portugal, living in the UK. My best guess is because the Dr. Oetker sprinkles are “all natural” with no artificial colors, flavors or preservatives (not to mention the fact that they are also vegan) unlike the generic store brand sprinkles she used which I bet meet none of those hallmarks lol. I have the same Stop & Shop brand in my cabinet I am just too lazy to go look. I tried using the wet towels around the pans when baking a cake for a special occasion a few weeks ago. It worked perfectly! The only issue I had was that even though the cake was cooked all the way through, when I took them out of the pan it was…sticky for a lack of a better word. Do you know why this happened or what I could do to ensure that next time I wont have the same problem? Thanks! I just made this cake yesterday using hundreds and thousands instead of sprinkles – unfortunately they pretty much dissolved as I was incorporating them. It tasted great though and my family thought it had a great marbled effect even if that wasn’t what I was aiming for! So a word of warning to anyone planning on using 100s and 1000s – don’t!! Hi Claire, it may have been because the 100’s and 1000’s are smaller but be aware of the fact that if you don’t get good quality decorating sprinkles, they too, will dissolve as that happened to be only recently… don’t use “Decor Sugar strands” and the brand is Dr Oetker…. they do dissolve 🙁 ! I don’t really know why. I have not had that happen before, wish that I could be more helpful! Okay so how do you get them so FLAT. I don’t bake often, but I DO have those baking strips. First thing I do is push them to the bottom of a sink full of cold water so they sink to the bottom. Then I start grabbing all my ingredients to bake. So they have been soaking the whole time. Then I wrap them around the cake. I still get a mound. Not a big one, but still a mound none the less. I did it exactly like I showed you in the pictures, I didn’t do anything special. But I do think that using quality, bakery pans really help. They cook more evenly. Will baking the cake a day in advance and wrapping them in plastic dry out the cake or retain its moisture? I use the bread trick, or frost it and keep it in the fridge. I think that frosting it keeps it moist and you can make it ahead of time. What type of knife did you use to get your frosting so perfectly spread? Hi, I’m planning to make this for our daughter’s first birthday tomorrow and I’ve read the recipe and method several times to make sure I haven’t left anything out. Just a couple questions though, is there any particular method to note to ensure that the sprinkles on top of the cake don’t end up everywhere except the outer rim of the cake? Also can I just use a cream cheese or normal buttercream frosting since I can’t get Marshmallow creme here in New Zealand? Thanks. Make sure you use sprinkles, and no there is no method. You can use whatever kind of frosting you like. Very Nice.. One of my friend tried it with round shaped sprinkles.. color really look great.. and very catchy to eyes.. you got nice recipes, dear .. Must visit my place when time persists..
Hello! This is slightly off-topic, but do you know where you got the little wooden jar (I think it’s holding the salt) in the ingredients picture? I’m charmed by it! Wonderful recipe! 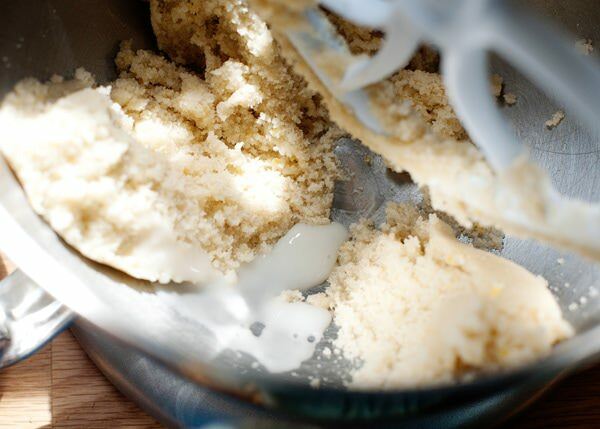 Cake flour is all purpose and cornstarch you can make your own. Google homemade cake flour. How are you? I was just wondering if this recipe would make cupcakes too? And if so, approximately how many? (Sorry for the bothersome questions, I have a cupcake obsessed friend and all the other recipes ask for cake mix). Yes, but I am not sure how many. Probably 24. Sooooo I have been sitting on this recipe for awhile and I needed a go to white cake recipe where I did not have to whip the eggs separately. I made yours today as the base of a zebra cake. I did not think this recipe was good. IT WAS AMAZING! Sorry had to do it. It was simple and easy and the cakes came out light and fluffy. I just did almond and vanilla extract in lieu of the lemon zest (although I love citrus zest) in the sour milk I used. I thought this recipe was amazing and I will make this my go to white cake recipe! Love your blog and all your recipes never fail! Hola yo vivo en españa donde puedo conseguir el suero de la leche o puedo sustituirlo con otra cosa gracias. I’m sorry, I tried to translate this, and I don’t think that I understand what you are asking. Estas hablando de leche agria? Si no tienes en Espana lo que puedes hacer es por cada taza de leche agrega una cucharada de vinagre o limon y dejala reposar por 5 minutos y eso te ayudara! Hi, I could not find cake flour so I bought self-rising flour. Will this affect the cake? Please reply soon as I need to bake he cake today. Yes it will affect, self-rising flour is not going to work here. You can google how to make cake flour, it is really easy. And I also just happened to be at my computer when you wrote this, but I don’t usually reply daily. For questions like this, google is your best friend. You can find just about the answer to anything you need. Good luck! A stick is 1/2 cup or 4 ounces. Hi, I’ve just made a cake based on yours (it’s not a white cake recipe, but yellow) and my sprinkles have disappeared :’-( any idea why is this? anyway, next time I’ll try your white cake 😉 Thanks for sharing!! I would like to do this recipe but I’m not sure I can marshmallow buttercream here. Any idea with what can I substitute it with? You can make it yourself if you are really ambitious, or use marshmallow extract. I can’t find marshmallow cream. So I just replace it with the extract and add it to the butter, sugar and vanilla? I have just made this cake for my nieces birthday and I tried the towel tip!!! Awesome tip!! I’m doing that from now on! I did however have a question. I noticed in your photos that your cakes ended up with a golden brown exterior and when I took mine out it’s completely white. I thought maybe there not cooked through all the way but I checked and they are done. Why do you think this is? Thanks Bree! Does the cake itself taste very lemony? I was wanting to make this cake for my daughters 5th birthday this weekend but am not too sure about the lemon zest. If you don’t like lemon, just leave it out and use all vanilla. Hi I tried making it, but mine turned out very sweet. The sprinkles got dissolved while the cake was being baked and added extra sugar in the cake. Next time I am going to reduce the sugar by half if I am going to use the sprinkles in the cake. Thank you. For the towel trick, do you put it over the cake or around the sides of the cake pan?just want to make sure I understand. hi. What if I want to make a different kind of a cake flat? What di I do??? I am making my own wedding cake for my wedding. Thanks. Jackie Hardman. It works with any kind of cake. I baked this last night and I also had the problem of it coming it dense. I know that white cakes that are from scratch aren’t ever as light as a cake mix but I didn’t like the texture or flavour of this cake. I have yet to find a good white or funfetti cake. I consider myself a good baker and better cake decorator.I can make a mean chocolate cake but I never have any luck with white cakes – either to dense or too dry. My search will continue for a good recipe. I am not saying this is a bad recipe it just didn’t work for me. I think that they are really tricky. You need to find the balance between structure and taste for decorating. Just want to say, I think it’s very nice that you make a celebration out of “back to school”. The world needs more of that attitude! Thank you Sarah! It’s one of my favorite family traditions. I would like to make 3- 6″ layers. Will this recipe cover that? This looks delightful and sooo cute! Can you please tell me your cup, tablespoon and teaspoon measurements in size – i think your sizes are different to ours in New Zealand (for example our cup size is 250mls, Tbsp 20mls and tsp 5mls. Just really want to get this right as your cake looks amazing and will be perfect for my daughters birthday! Hi! Just wanted to thank you for your delicious recipe! I’ve made two cakes with your recipe, one sprinkle cake and another with skittles lined up in a rainbow on top (hid all my frosting imperfections). I’m set to make my third. I just cannot get enough of that lemon! Yummy! Thanks again! Hi there! Thank you so much for this recipe. The search for a white cake recipe is over! This came out super moist and fluffy! Beyond what I imagined. Liked boxed cake but BETTER! My son requested lemon cake for his 7th birthday, and we just did a test run of this and he said it was the best cake and frosting (lemon marshmallow buttercream!) he’s ever had. I’m sending everyone I know to your post! This cake was good but very similar to a pound cake, I prefer a cake that is more moist and soft. Which brand of Marshmallow flavoring did you use and where did you find the lemon Essence? What brand of Lemon Essence? I ordered the marshmallow off of Amazon, I’m not sure of the brand. I don’t have a preference for brands of lemon extract, I buy whatever is available. I’ve never made a cake from scratch but eager to try this as it seems easy. However I’m hesitant with the lemon zest and extract – how strong does the lemon flavor come through? And will it be soft and fluffy (like the easier cake mix route)? It’s a lemon cake, but if you don’t like lemon then leave it out. And no, it is not like a cake mix. I have not had good luck with adding chocolate chips to a fluffy cake. I’ve tried flouring the chips and that didn’t really help either. Ok thanks for getting back to me! Baked this cake a few days ago for a coworker’s last day at work. Everyone raved about it. I had one small piece, and I just loved the lemon flavor present in the cake and frosting. This was the first layer cake I’ve made in probably over a dozen years, and it was a great learning experience. I’d like to make this again as a white cake with shredded coconut. Woo!! One mistake I made was frosting the cake too early causing a bit of the edges to breakaway, and I also felt like I would make 1.5x this frosting recipe, because it was getting a bit thin on the edges. I think it’s tough for me to judge how much buttercream to use in between layers, and on top of the cake, etc. Haha. But I’m learning! I’ve started doing a crumb coat and it makes all the difference. I think that I need to make a video out it because it’s so helpful for getting a smooth cake. Is that whole milk? Then yes. Im making a hello kitty funfetti cake to my daughters birtday but im kinda busy so i Wonder if you think it can work and make the cake in advance and then freeze it untill its time to put it together? 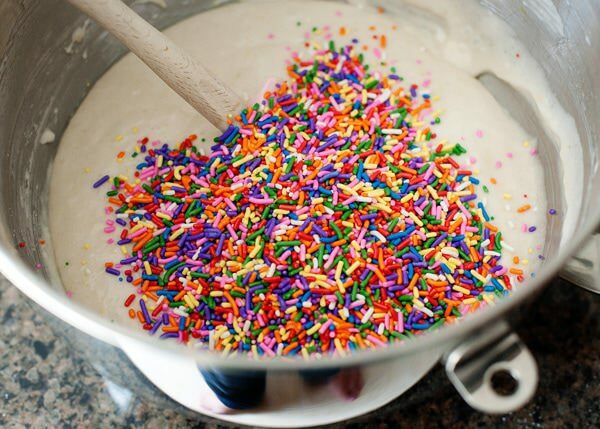 Im worried about the sprinkles if they will melt in som way and then the coulor will be smerged??? Freezing the layers should be fine. Just wrap really well in plastic wrap. I have been baking decorated cakes since the mid 70’s! I have used strips of towels folded into three layers long before the “fancy” ones were invented. I actually have a set but prefer my old standby towels. I wet them, wring out the excess water and wrap around the cake pans. The concept is to keep the outside portion of the cake from baking too quickly and pushing up the center. If you cut the towels into six-inch wide strips they can be folded into three thicknesses making a two-inch deep strip. Always wet them thoroughly! Works for me. I came across this recipe not too long ago and have made it twice already! It’s amazing! I’ll actually be making it for my friend’s wedding next week. 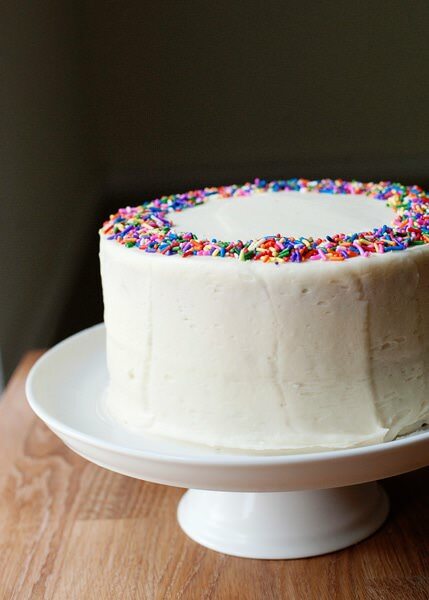 I absolutely love the texture of the cake and was wondering if you could also use this as a white cake if you took out the sprinkles and lemon zest and flavor? Thanks so much for this yummy cake! Of course! I am glad that you like it so much. I know you posted this cake ages ago and I have been making this recipe for years. But as I pop back to your site for the recipe yet again (now for my eldest daughter’s 7th birthday), I wanted to take a minute to let you know that this cake has become a family tradition for us. No matter what other cakes I bake, no matter how much they like them, this is ALWAYS what is requested come birthday season. I have not met anyone who has not loved this cake when I make it, and I know it is the favorite of both of my daughters! Wishing you a delightful Sunday and well in all that you do! This makes me so happy. I love to think that this cake is part of your family traditions. Thank you so much for letting me know this. Thank you so much for sharing this I am so going to try this It looks and sounds delicious!!!! I baked this cake for Easter and it was absolutely AMAZING. I’ve been baking cakes from scratch for almost three years and this is by far my favorite recipe I’ve made so far. It’s also super easy and nearly impossible to mess up. Not only are the sprinkles beautiful and vibrant but it is absolutely delicious. From the dense and fluffy texture to the summery sweet lemon flavor. Wow. I’m tearing up just thinking about it. I love this cake. I just made this cake. It didnt rise as high as I think it should have. What did I do wrong!? I’m really sorry, it is hard to tell. I would start with new leavening agents. 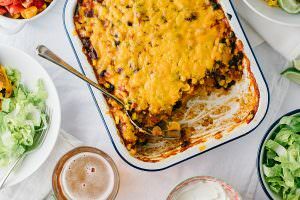 Hi there, Looks like this post is a little old but it sounds like it’s a great recipe. I have a 12 inch round pan that I just bought, would you suggest doubling the recipe and then filling it halfway or not? My intentions are to make a three layer cake in the end. I’m not sure. I never have luck making layer cakes that big. I typically bake it in one pan (with high sides), let it cool completely in the pan, and then turn out and cut into three layers.